DetroitKnitter: Are You? If you are On-On this race if for you! Are You? If you are On-On this race if for you! Word has it from a very reliable source that hashers will be on the course as runners as they make the final stretch on Atwater. Looking for the on-after? McShane's at 1460 Michigan Ave in Corktown will be the place to reload your carbs and begin your recovery. • Some stats: Last year, the event surpassed 20,000 participants for the first time. This year, that number should reach 24,000, according to race organizers, and the event was declared a sellout in August. Detroit has the only marathon in North America that includes two international border crossings and Detroit has the only Underwater Mile in distance racing. Marathon & Beyond magazine included Detroit in its ranking of the Top 25 finisher medals for North American marathons. Competitor magazine included Detroit when picking its 26 most memorable miles from marathons across the country. The magazine called the mile over the bridge as "more scenic" but the mile through the tunnel the "more memorable." Rodale Publishing (parent of Runner's World magazine) selected Detroit as one of its 10 best events for first-time marathoners. This year's field includes runners from all 50 states and 16 countries. About 85% of the runners live in Michigan. The average runner is 38 years old, about the national figure for distance races. The field is 57% female. • The addition: The event started its exponential growth when a half marathon was added in 2004. The 13.1-mile half always has covered the first part of the marathon course, which starts downtown, crosses the bridge, returns through the tunnel, snakes through Corktown and finishes downtown. This year, a half marathon has been added that will cover the back part of the marathon course. It features a later start time -- at 11 a.m., four hours after the main gun -- and stays strictly on U.S. soil. The highlights include the RiverWalk, Belle Isle and Indian Village, with its enthusiastic crowds. • The bridge: For years, the Gateway Project has put a construction squeeze on runners while crossing into Canada. Last year, runners had more room on the bridge, from a 10-foot to a 22-foot-wide lane, after the Detroit International Bridge Co. finished redecking the 83-year-old structure. This year, with more ramps and access roads open in the Gateway Project, runners should face far less congestion and far less vehicle traffic approaching the bridge. In one section, for about a quarter-mile, runners were on the gravel and dirt Bait Shop road, bordered by a fence and squeezed into a 12-foot-wide lane. Bill Ewing, operations director, said the course now could utilize paved access roads, have more room (at least 30-foot lanes), enter through new tollbooths and take a more direct route from the plaza onto the bridge. • The app: Before the 2011 event, Detroit became the first major race with a smartphone app. This free app, recently updated and enhanced, can be used to register for events, check course maps, view aid stations, read FAQ's, search results, see photos and track runners during the races. To download the app, search for "Detroit Marathon" in the iTunes Store or Android Market. With thousands of runners, volunteers and spectators rushing downtown in the dark, parking and logistics for many people can turn into a mad dash to the starting line. That's because countless runners each year do not arrive early enough, then must battle traffic and congestion, hunt for parking and line up for a Porta-John. Still, runners should try to get downtown by 5:30 a.m., or 90 minutes before the starting gun. Some streets start to close as early at 6 a.m. The start (and finish) again will be at Fort and Second streets, near the Free Press building and Doubletree Hotel. Because this area is a hop, skip and a jump from the Lodge Freeway, the exits for Bagley, Howard and Jefferson will be traffic magnets. So think outside the jam. Race organizers have partnered with Detroit Municipal Parking and Olympia Entertainment again for a wide selection of 20 parking options near the start/finish line at $3, $5 and $7. Other private lots will be available. (Detailed maps can be found at the race website and at the information booth at the race expo.) Parking locations include Joe Louis Arena, Grand Circus Underground Garage, Premier Underground Garage and lots off Sixth Street between Lafayette and Porter. Most lots will open at 4:30 a.m. and all by 5 a.m. The People Mover will begin working at 5 a.m., too, so parking far from the start and taking a ride could be a convenient option. The closest stations to the start area are Michigan Avenue, Fort/Cass and Cobo Center. Contact Gene Myers: 313-222-6736 or gmyers@freepress.com . Follow him on Twitter @genemyers. 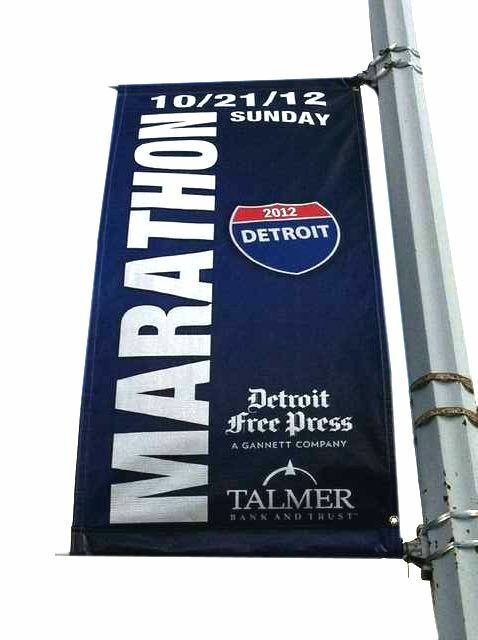 What: 35th Detroit Free Press/Talmer Bank Marathon. When: 6:58 a.m. next Sunday. Where: Streets of Detroit and Windsor. Marathon starts and ends downtown at Fort and Second, near the Free Press building and Doubletree Hotel. 6:58 a.m. — Disabilities division. 7 a.m. — Marathon, international half marathon, relay (wave start in which groups go off in two-minute intervals). 7:25 a.m. — 5K run/walk (start on Lafayette at Washington). 11 a.m. — U.S. half (start on Congress at Beaubien). Afterglow: Conquered: The Official Marathon Afterparty, on Lafayette between Third and Lodge Service Drive (one block north from finish), 9 a.m.-2 p.m. No charge. Open to all entrants and the general public. Music from Larry Lee (a former Lion) and the Back in the Day Band. Local food truck favorites Dago Joe’s, Jacques’ Tacos, People’s Pierogi Collective and Green Zebra. Interactive games, face painters, balloon twisters and photo booth. Official race merchandise tent. Beer sales start at noon. Field: Expected to hit 24,000, up from last year’s record of 20,940. In 2000, the event drew 3,588 participants. Men — Greg Meyer, Grand Rapids, 2:13:07, 1980. Women — Elena Orlova, Russia, 2:34:16, 2004. Information: Click on freepmarathon.com. Follow the latest updates on the race’s Facebook page and through Twitter. Mark your calendar: The 36th Detroit Free Press/Talmer Bank Marathon will be Sunday, Oct.?20, 2013. Registration opens Jan.?1. What: Health and Fitness Expo, home for runner packet pickup and featuring more than 90 exhibitors with the latest in running apparel, footwear, technology and nutrition. When: 3-8 p.m. Friday and 10 a.m.-7 p.m. Saturday. Where: Cobo Center, downtown Detroit. Packet pickup: All races are sold out. Marathon, half and relay entrants must pick up race packets at the expo. Race-day pickup is not available. Entrants in 5K events can pick up packets at the expo or 6-7:15 a.m. on race day at the corner of First and Lafayette. If crossing the border — that’s everybody in the marathon, international half and relay legs Nos. ?1 and 2 — you cannot pick up your race packet without a passport, passport card or enhanced driver’s license. Runners for the U.S.-only half, relay legs Nos. ?3-5 and 5K run/walk need only photo identification.